A few months back I was a guest speaker at local Geography Club. Members included both adults and children aged 7-15, so I was looking for a topic that would have wide appeal. The one I chose? The numerous cool cultures I discovered on my travels! Below are three cultures that I didn’t know existed before my two-year trek. It’s always exciting for me to learn more about lifestyles previously unknown to me and to share my discovery with fellow travelers (like you!). There are about 50,000 Kuna scattered throughout the 378 islands of the San Blas archipelago. A matriarchic society, the groom takes name of the bride and moves in with the bride’s family upon marriage. The women are known for their intricate bead work and applique designs called molas. The Kuna Indians are originally from Colombia. In the 16th century the Kuna migrated north to Panamanian coastline because of tribal conflicts with the Spanish and other native peoples. In the early 20th century, the Panamanian government tried to assimilate the Kuna but they were fierce fighters and were granted an autonomous state, the Kuna Yala, in 1925. Today, the Kuna have the largest degree of autonomy of any South American indigenous people. The Kuna are specimens of excellent health, with relatively low levels of heart disease and cancer. Doctors believe it may be the two cups of coca the typically drink each day. While the Kuna’s overall health is outstanding, there is a high incidence of albinism within the community. The Kuna consider people with albinism to be a separate race of people and they are awarded a revered place in Kuna society. Kuna folklore holds that those with albinism defend the moon against dragons and thus are only permitted outside during a lunar eclipse. It’s true that I saw a large number of a large number of women and children squirreled away inside their huts. I visited a Kuna village during my time sailing in the beautiful San Blas. Meeting several families, sharing a lunch and visiting a school. It was truly a delightful afternoon! Vietnam is a multi-ethnic country with 54 distinct ethnic groups recognized by the government. In fact, more than 12% of the Vietnamese population (> 6 million people) claim minority tribe heritage. For the most part, Vietnamese tribes live in relative independence, with their own traditional customs and culture, following an animistic belief system. I was introduced to the northern hill tribe the Hmong by my guide Yia during a three-day trek into the hillside. Yia is 36 years old and a mother of four. She’s illiterate but speaks three languages: Hmong, Vietnamese, and English. She learned her English by selling handicraft souvenirs to tourists. Before Yia became a tour guide, she never walked more than three hours beyond her home village. While hiking amongst the villages, we stayed with local families in either mud or wooden huts. 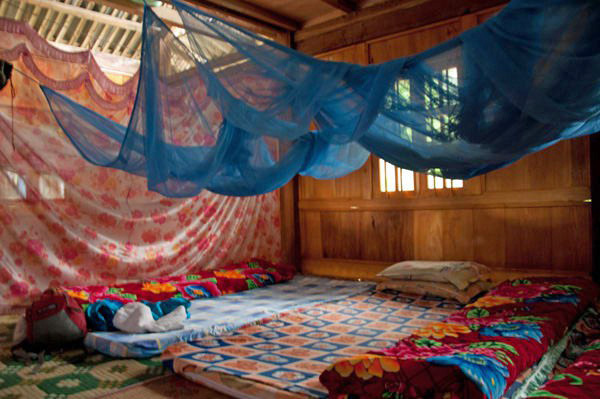 We slept on mattresses on floor in one room and ate together in a circle, perched on small wooden stools. Our meals consisted of water buffalo meat and field greens we picked walking along the trails. Like the Kuna, the Hmong a famous for their attire. Each set of clothes goes through an indigo dying process where the rough hemp fabric is dyed and dried every single day for at least 3-4 months. Once the cloth is a deep midnight blue, the fabric is rubbed with rocks to make it shiny. The tunics are adorned with needle-pointed arm bands and belts. Each of these pieces of needlework takes about one month to make and is a great source of pride for the women. 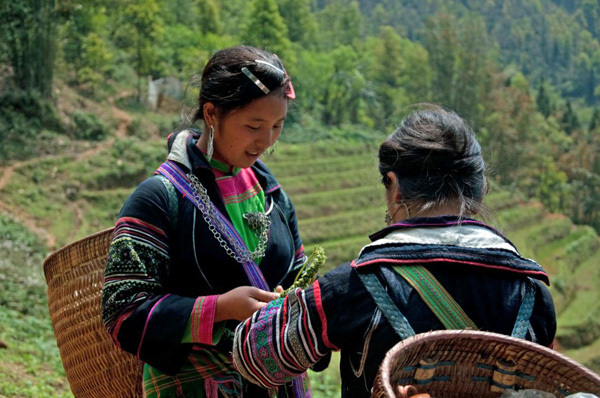 In fact, when Hmong women greet one another, they often admire one another’s outfit and compliment their choice of design. I was lucky enough to purchase a tunic from Yia’s family – a fabulous memento of my time in the Northern Vietnamese mountains. The Garifuna comprise 10% of the Honduras population, totaling about 700,000 people. I was introduced to the Garifuna by Dr. Harry Castillo Luther, the first Garifuna to earn a medical degree. I spent the day with Dr. Luther at his home in the small seaside town of Le Ceiba. It was sitting in Dr. Luther’s backyard and admiring his herb garden that he told me about Garifuna history. He explained to me that Garifuna ancestors were West Africans forced into the slave trade and brought to the Caribbean islands of St. Vincent, The Grenadines and Dominica. Here they developed a reputation for rebelliousness and so the plantation owners deported them to a stretch of the Honduras mainland known as the Mosquito Coast. Today, the Garifuna live in the thick jungles of this isolated coast, spanning the southern bit of Honduras and most of the eastern Nicaragua coastline. They have very few social services or modern amenities. As a result, the Garifuna has a very high infant mortality rate. Exacerbating their isolated existence is a history of rife discrimination within broader Honduran society. Spending time in these communities and learning more about their indigenous cultures is one of the reason why I travel. I’m fascinated with how people around the world live and learning about their histories and social mores. This type of adventurous travel is more than just educational—it’s addictive! This entry was posted on Thursday, October 31st, 2013 and is filed under On the Road. Dear Erin, this blog entry immediately resonated with me, as your posts invariably do! And, it made me think instantly of my dear friend Anya Lim of Anthill Fabric Gallery, https://www.facebook.com/AnthillFabricGallery who deals expertly, creatively and dynamically with indigenous cultures and empowers them through her considerable fashion design, e-commerce and social media expertise. Anya and you truly are kindred spirits. Anxiously awaiting your book tour visit here to Las Vegas in 2014.